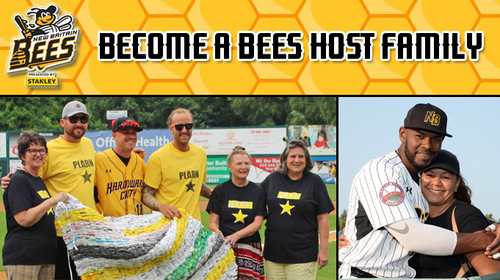 The New Britain Bees are currently seeking community members that are interested in becoming host families for a Bees player during the 2019 baseball season. Hosting a player has many benefits to a family. It is a valuable way to provide a player with a home while keeping them involved in the community and also gives you the opportunity to be involved with the Bees on a personal level. For many families, hosting a player has made a special impact on their lives as well as their “adopted” family member. CLICK HERE to view the Host Family Information Form. The requirements for becoming a host family include the ability to provide a private bedroom and access to a bathroom, kitchen and washer/dryer. If you wish to include any other amenities for your host player, it is greatly appreciated by the player. For becoming a host family, the Bees will give you the opportunity to attend every home game during the 2019 regular season. You will also be invited to many special events throughout the year, including a picnic event at the end of the season where your family will be able to take live batting practice on the field. For making one of our players feel at home, the Bees will make sure you feel like part of our family as well. -10% discount at the Bees Merchandise Shop, B.Hive & Co.
For more information about becoming a host family for a New Britain Bees player, please contact Bret DeRosa at 860-826-2337 x.102 or bderosa@nbbees.com. The Bees would like to thank you for your interest.